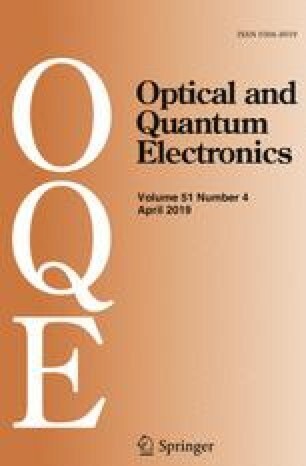 In this paper, we propose a novel refractive index sensor with large dynamic range based on fiber Bragg grating in the nano-bore optical fiber. The spectral responses of grating on the filling index in the bore with different bore diameters and index ranges are numerically studied by the finite element method and coupled mode theory based transmission matrix method. It is found that the Bragg wavelength of grating is sensitive to the filling index in the bore. The influences of bore diameter on the wavelength sensitivity, resolution and dynamic range of the index sensor are analyzed. There exists a trade off between the linear dynamic range and sensitivity of index when the bore diameter varies. The optimized wavelength sensitivity and resolution of filling index are 53.6923 nm/index unit and 9.3123 × 10−6 index under a linear index range of 1.0–1.4 using 2 µm bore diameter. The optimized linear dynamic range of index is 1.0–1.48 with wavelength sensitivity of 13.3056 nm/index unit and resolution of 3.7578 × 10−5 index using 1 µm bore diameter. Our proposed index sensor has the technical advantages of simple all-fiber structure, large index range, and potential capability to synchronously detect index, temperature and strain. This work is supported by the Beijing Natural Science Foundation (4192047), the Fundamental Research Funds for the Central Universities (2018JBM070), the National Natural Science Foundation of China (61675019), and the Program for Changjiang Scholars and Innovative Research Team in University (IRT_16R07).